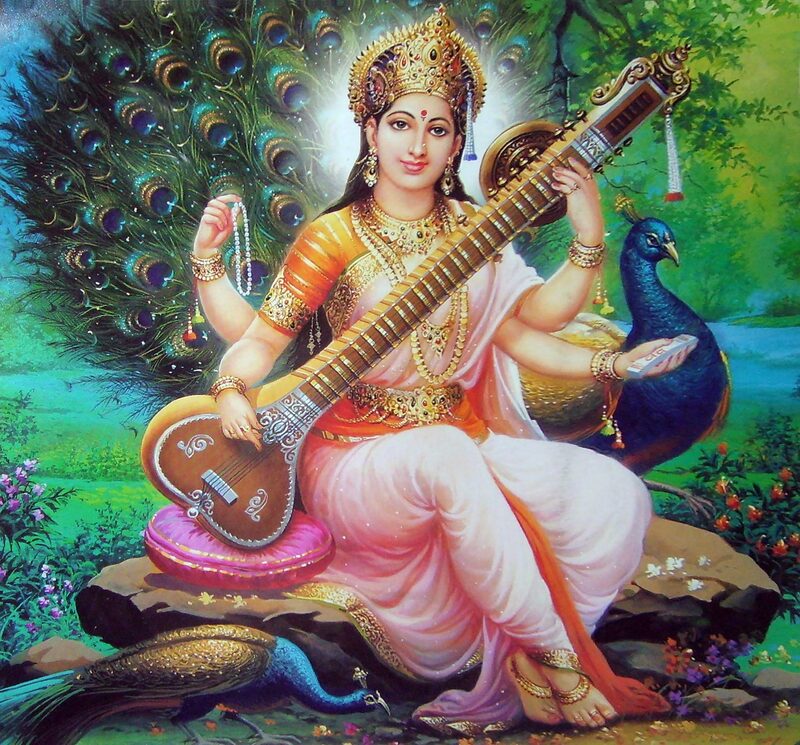 I have been fascinated by the sitar ever since I first heard George Harrison play Norwegian Wood when I was young. It was December 1965 and I bought the newly released Rubber Soul album while shopping with my mother at “Bradlees” department store. To this day it remains my favorite album of all time. I also listened to Ravi Shankar and was fascinated by the album “West Meets East” with Yehudi Menuhin. And now I find myself also fascinated by Anoushka Shankar, Pandit Ravi Shankar‘s daughter (and incidentally, Norah Jones’ sister!). 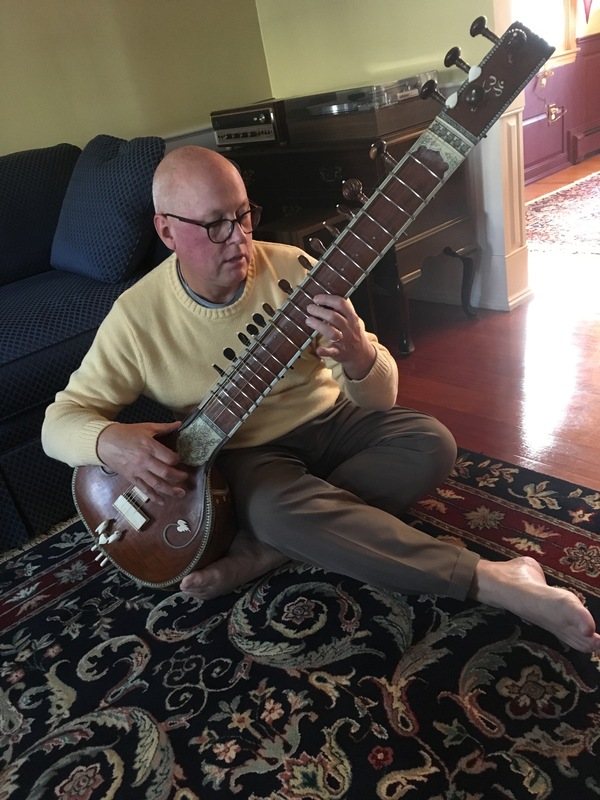 Several years ago I obtained a beautiful old sitar that was in serious need of restoration. The neck was twisted, there were holes in the gourd, scratches galore, missing binding and trim, deteriorated finish. But, all of the parts were there. I found a number of replacement parts like bone fine tuners, new strings, fret tying thread, etc. The first task of the reconstruction was straightening the neck, which was quite twisted. First the top plate was separated from the neck and then re-glued and lashed to a 4×4 beam until cured. 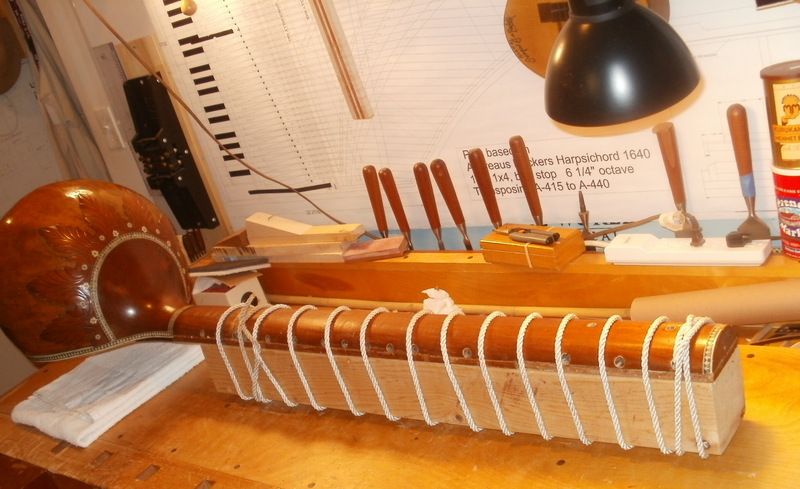 I failed to take pictures when I had it apart, sadly, but here is a picture of the sitar lashed to the 4×4. Straightening the neck of the sitar. Once the structural work was complete, thanks to several articles about sitar construction and repair I found on the internet, I filled all of the holes in the gourd (body) and applied some color and varnish (after a thorough cleaning of course!). 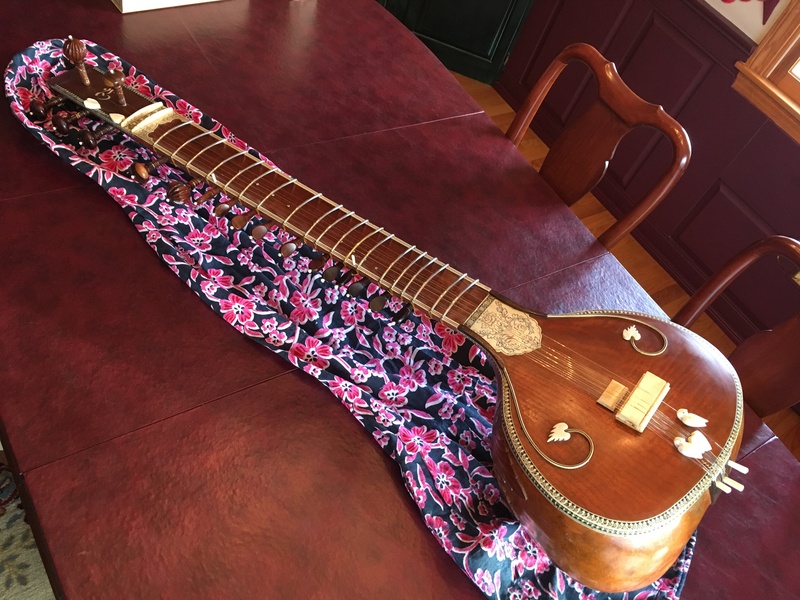 Finally the sitar has been fully restored and awaiting someone who can play it. Perhaps it is time to learn to play Norwegian Wood! The sitar fully restored and ready to learn to play Norwegian Wood! I’d better start with some scales!